Collins Booksellers - Accepted! 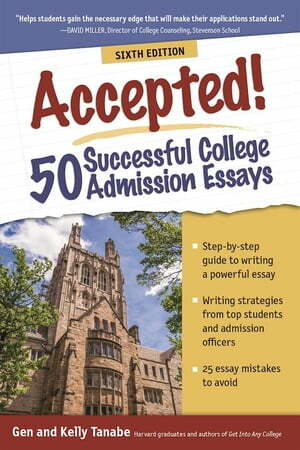 50 Successful College Admission Essays by Gen Tanabe & Kelly Tanabe, 9781617601385. Buy this book online. Students will prepare powerful and successful admission essays with the tools provided in this invaluable, newly-updated resource for the college-bound. Examples of 50 real essays are included, discussing such topics as leadership, personal obstacles, athletics, public service, special talents, and future goals. The strengths and successes of each example are analyzed, as well as the inspirations of each writer. A comprehensive writing workshop provides tips toward selecting topics, developing stories, editing drafts, and applying finishing touches. Further examples of 12 unsuccessful essays, a list of 25 easy mistakes to avoid, and new interviews with admissions officers are presented to help would-be entrants avoid costly blunders.